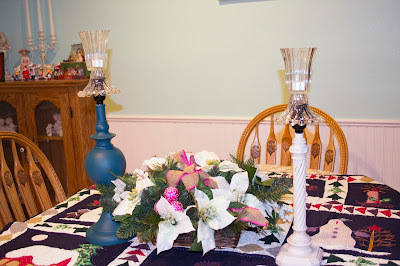 Christmas is over and I wanted to show the last of my holiday decor. I had a party here in my home with the members of my women's writers group and it went well. Everyone had a nice time and enjoy the decor and food. 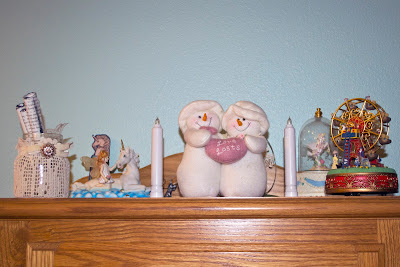 The stuffed snowmen were a gift from my husband years ago, and the heart says "Love Lasts." I miss him. He was always generous and thoughtful. The snowpeople on each end make music and move when you press a certain spot. 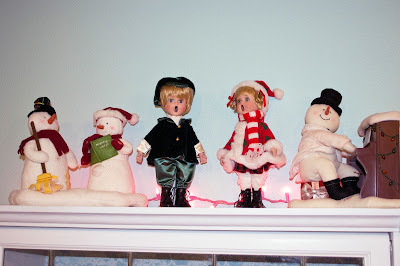 I added my two porcelain caroling dolls to sing along with them. 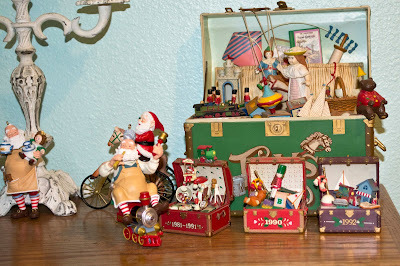 A few little toy boxes and Santa's. 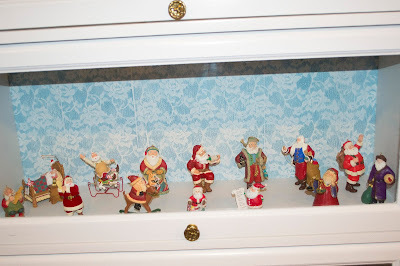 Some of my Santa collection. I forgot to photograph the other shelf full. 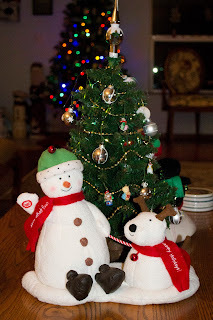 And more musical snowmen on each side of the mini-tree. 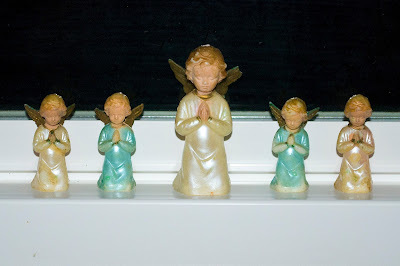 My Christmas centerpiece and the little 1/2 inch and smaller angels that my mom used to have and passed on to me a number of years ago. Only one lost her wings. 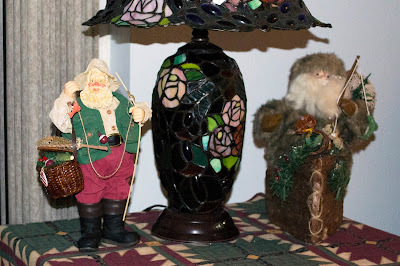 These two Santa's were my husbands, representing his love of fishing. 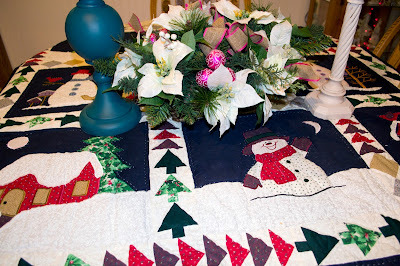 I used a small quilt I found at a thrift store as the table cloth. It is so lovely and was only $10! 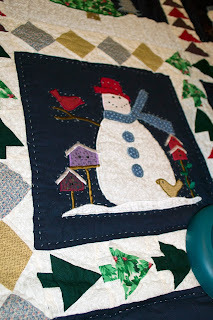 The quilted squares are cute! 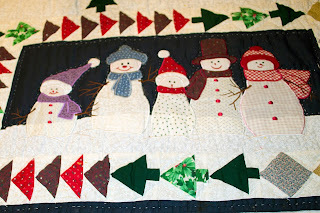 Here is a peek at a few of them. 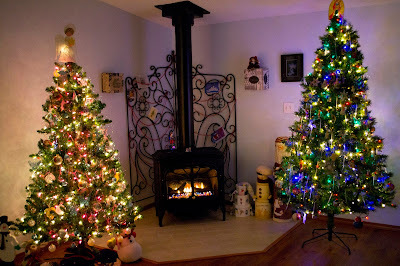 And my 2 Christmas trees surrounding the fireplace! 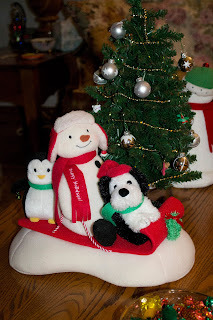 This was shot before adding the tree skirt. Luckily I was well in time for Christmas. I had a very nice time with my best friends family, who adopted me after my husband died. Sue and I have been best friends since 1967 in high school. She is one of the blessings in my life. Her family is like my own. Sue's daughter, Christina. and her family live only 6 miles from me and I baby sit for them and spend time with them. last all through the new year! Yea! Thank you Rose. I hoed someone would post so I could see what I missed. Looks so festive. Cute decorations. Glad to hear you are feeling better. Rose, it all looks wonderful! Love your collection of musical toy boxes. My mom had the green one. One of my older sisters has it now. 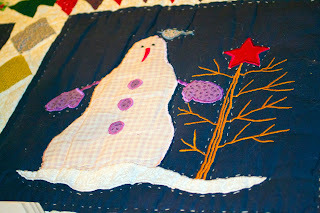 So glad that you have your sweet friend to spend time with during the holidays! Happy New Year my friend! Two trees - my kids would be in heaven! Lovely decor. Wishing you a wonderful year ahead. It looks and sounds like you had a lovely Christmas. It is nice that a family has 'adopted' you and that they live close. You are such an artist. It all looks splendid! Rose and joyous and pretty post as always - you do have fabulous and loving friends and may the new year bring you all good things. Happy New Year Rose. I'm glad to read you had a nice Christmas. Have a great new year! 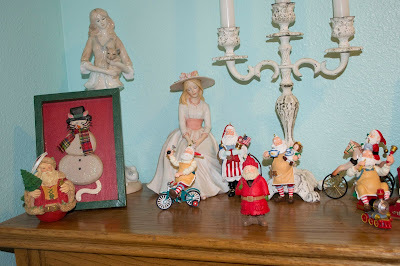 Great to see more of your Christmas decor. Hope you have a fabulous 2016!